MAPLE BEDROOM Hand-crafted maple beds and finishes celebrate the natural beauty of the wood. Artisans enhance the look with a time-worn, heirloom aged effect. Your choice of straight edge or “live edge” for these handmade beds, in 16 beautiful finishes (9 wood tones, 2 weathered finishes, and 5 painted finishes). OAK BEDROOM Custom made wood beds and cases in varieties of white oak and red oak. The artistic grain, natural markings, and range of colors gives this collection textual appeal. No less than 8 distinctive finishes in a range of colors offering design versatility for many lifestyles. American made bedroom furniture this beautiful, this customizable, this well-made isn’t easy to find, or to imitate. 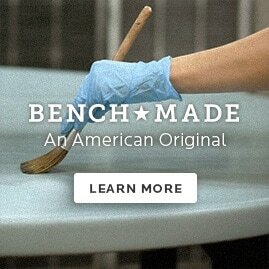 If it’s Bench*Made, it’s made just for you, one at a time, exactly the way you want it. Bench*Made furniture is substantial, built to last a lifetime. Maple finishes include 9 wood tones in medium to low sheen, 2 weathered finishes, and 5 painted finishes; 8 oak finishes are available, wire-brushed to open up the grain and allow the finish to amplify its textural effect. Bassett handmade wood beds and case goods are American originals. You really can’t make them any better than this. With artistry, precision, and painstaking attention to detail, Bassett’s finest craftspeople create each Artisan Bedroom piece by hand. The entire Bench*Made line is made old school, in Bassett, Virginia where Bassett started making hand crafted American made beds back in 1902.